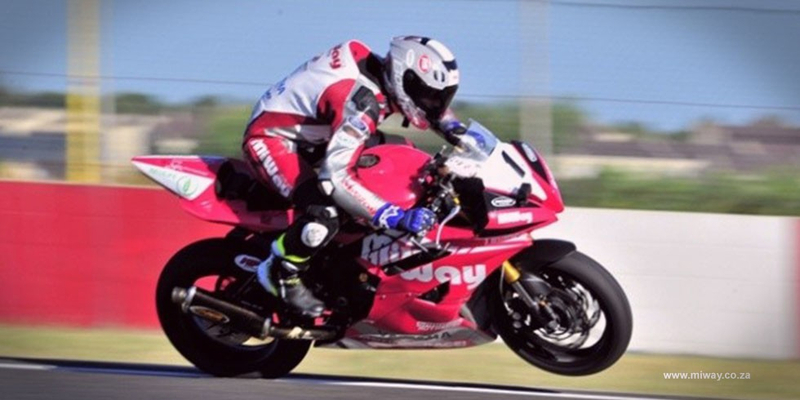 At MiWay, we’ve taken our understanding for bikes, accessories, riding gear, motorcycle trailers and their value to the next level by teaming up with Anassis Racing. We are proud to be the title sponsor of the Anassis Racing team for the 2017 Super-GP Championship Trophy Season. The Pretoria-based superbike race team outfit celebrates 10 years this year and is widely regarded as South Africa’s most successful team. The past few months of the sponsorship have seen the team painting the race tar and podium cerise with a number of wins already – staying true to being the winning team. “Signing MiWay Insurance for the 2017 Super-GP Champions Trophy season is a huge accomplishment for our team and we are grateful to have a new title sponsor of this allure.” – Brad Anassis, Founder of Anassis Racing. Anassis Racing was founded in 1992 by Brad Anassis, a Seven-time South African Drag Race champion and the first motorsport competitor in SA to be awarded national colours for Drag Racing. With a view of highlighting the achievements of this proudly South African team and promoting sports country-wide, MiWay has been travelling with the team as they have gone on their journey to more victories in the championship. With more races still coming up, spectators can enjoy elevated entertainment from the specially constructed hospitality unit at each race. “It’s a great honour for MiWay to be associated with such a successful South African team, and to be part of what looks to be a historic season. This is an ideal opportunity for MiWay to assist in the promotion of both the sport and this incredible racing outfit, and to highlight local success stories that many South Africans are not familiar with.” – Nthabiseng Moloi, Head of Marketing & Brand at MiWay Insurance. MiWay further understands bikers’ insurance needs from personal experience; if you are looking for motorcycle insurance to suit your budget, with benefits like free roadside assistance – contact us to find out how you can get affordable cover.